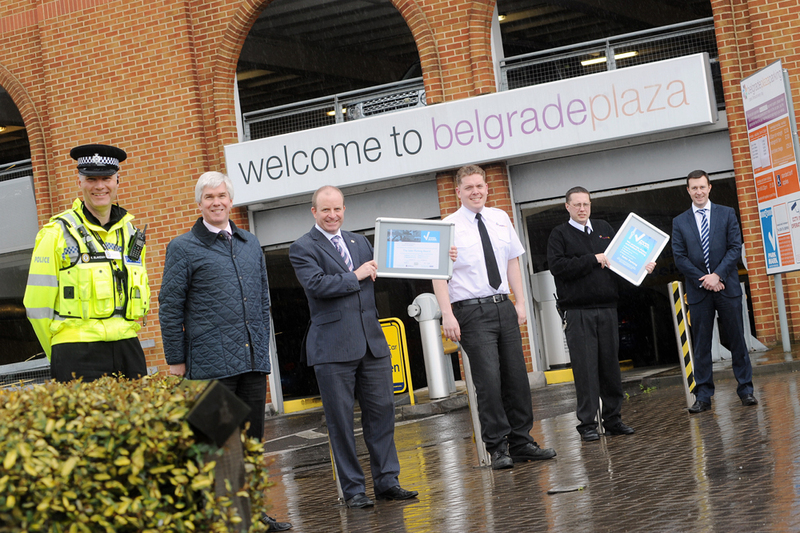 Belgrade Plaza » An award-winning car park in Coventry is continuing to make its mark with another accolade. An award-winning car park in Coventry is continuing to make its mark with another accolade. Left to right: Kerry Blakeman, James Crawford (Belgrade Plaza Partnership), Andy Gregory, Josh Canavan (Belgrade Plaza Car Park), Jon Oakley (Belgrade Plaza Car Park), Ian Clorley (Belgrade Plaza Partnership). Police chiefs have urged car park operators to follow the lead of an award-winning Coventry car park. Belgrade Plaza’s 1,072 capacity car park recently received the Park Mark standard because it has introduced measures to help deter criminal activity and anti-social behaviour. The car park was judged on several criteria including quality of management, standard of lighting, effectiveness of surveillance and the overall environment. The Park Mark certification is awarded by the police and Kerry Blakeman, chief inspector of the Coventry Local Policing Unit, said it gave peace of mind to customers. The Park Mark ‘Safer Parking Scheme’ is an initiative of the Association of Chief Police Officers (ACPO) and is aimed at reducing both crime and the fear of crime in parking facilities. It is a nationwide scheme operated by the British Parking Association on behalf of ACPO, and drivers can search the website to find accredited car parks in their town or city (for more information see – http://www.parkmark.co.uk ). Sergeant Andy Gregory, one of West Midlands Police assessors Police said “The more car parks that aim for this standard and achieve the Park Mark award, the better it is for the city, its businesses and its citizens. Drivers that use accredited car parks can enjoy their visit to the city, and be far less likely to become a victim of crime”. The car park has undergone significant development and improvement as part of the overall development of Belgrade Plaza, which includes a Bella Italia and Pizza Express.